September is this awkward time when it can be hard to decide what to wear. And as much as we love planning cozy fall outfits, there is something sad about summer trends coming to an end. So before you put away all your summer clothes, we gathered few ways you can transition into fall with just a few simple styling tricks you can take your favorite warm-weather basics into fall. Pair your favorite summer dress with Hunter Boots and a long cardigan for a perfect casual fall outfit. Pair your favorite skirt with ankle booties and oversize scarf. 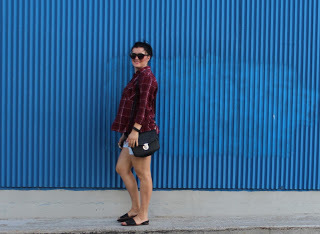 This is my go to @OOTD when transitioning into fall. Wear all favorites by layering. Add a plaid shirt over your t-shirt and pair it with your favorite shorts, or wear maxi dress with a long sleeve over top. You can take (almost) any skirt from summer to call by pairing it with boots and a leather jacket. How do you wear your summer clothes into fall?